With the sun overhead and legs burning from the walk up the mountain, delegates took their seats Sunday morning to begin the opening ceremony for the 46th Annual YMCA Conference on National Affairs. This is the first year that the ceremony was held as the first activity of the conference. While waiting, they sang God Bless the U.S.A. as the 32 flag and placard bearers took their places on and in front of the stage. From Alabama to Wisconsin, the delegates were called up to show their pride and show others they are here and ready to take part in this great conference. “I feel so united and connected with my state delegation, being able to represent them was a great experience,” flag bearer Lauren Courtney of Michigan said. The American flag, the final flag to enter the stage, served as a symbol of unification. Although delegates hail from all parts of the country, in planes, buses and cars, they all come to be together. Opening ceremony not just signifies a kick off to the conference but a reminder that all the delegates in attendance share one common goal; to make a difference. 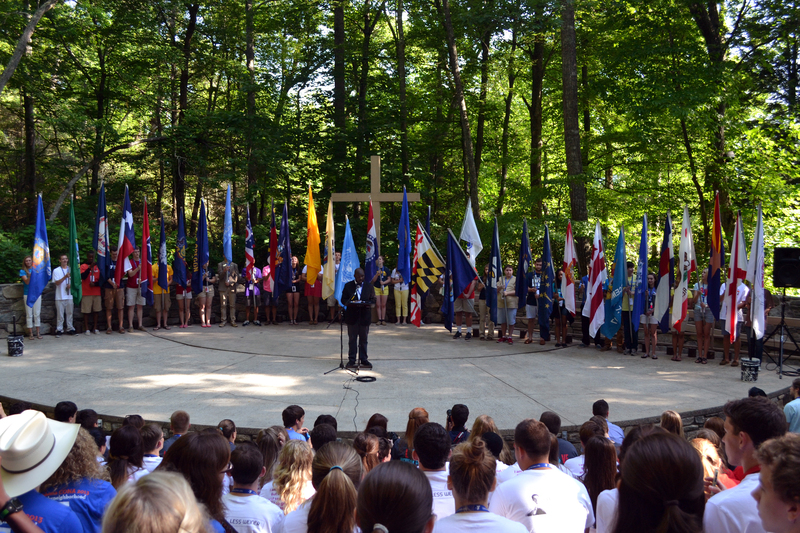 Conference Director Bob McGaughey told the delegates to live a life of character now and off the mountaintop. He encouraged delegates to be the change they want to see. McGaughey’s speech instilled in the delegates that even as opening ceremony started with many cheers and chants, it closed with one common tidbit of wisdom: Make new friends, share ideas, and make your difference, whatever it may be.